Specifically designed for use in the Smith & Wesson M&P 15-22, CCI’s AR tactical 22-long rifle ammunition is ideal for use in AR style weapons in .22 caliber. These rounds are engineered for smoother feeding and performance in this style of weapon, whether it be for training purposes or just good old-fashioned plinking. 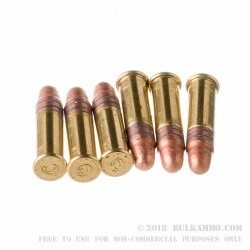 These rounds feature a 40-grain, copper plated round nose projectile, loaded into a rimfire primed brass casing and are capable of a muzzle velocity of 1200 FPS, while still maintaining a speed of 964 FPS at 100 yards. 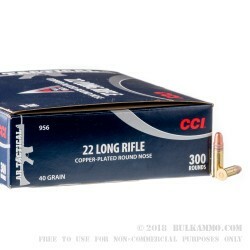 Established in 1951, CCI ammunition has been a top producer of .22 rimfire ammunition and high-quality primers. 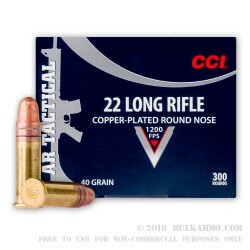 Whether you’re using .22 for hunting, plinking or competition shooting, CCI has a line to suit any shooting application. Part of the Vista Outdoors Group, CCI, alongside other firearm bigwigs such as Federal, Blackhawk and Hoppe’s 9, continues to produce high-quality, reliable ammunition at an affordable price. Q: Is this the CCI # 0030? A: Hello! 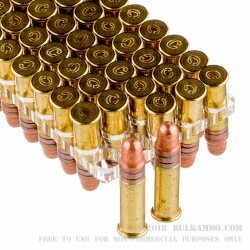 This ammunition is not the same as the 40 grain Mini Mag HV. This specific product number is 0956. 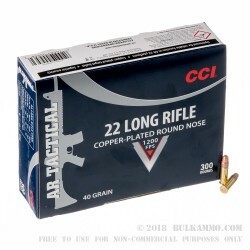 Q: What is the velocity of this 300 Rounds of .22 LR Ammo by CCI - 40gr CPRN ammo? A: Hello Charles, CCI lists the muzzle velocity of this round at 1235 fps.